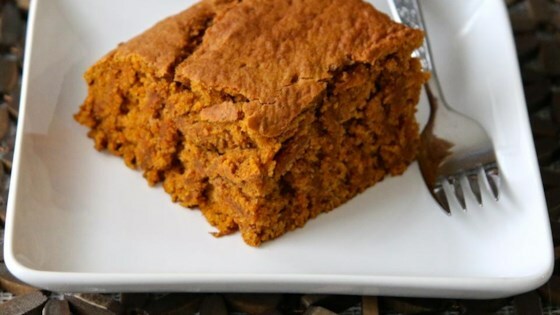 "Excellent pumpkin pie flavor is packed in these little blondies and they always get rave reviews! And they're vegan!" Sift flour, white sugar, brown sugar, baking powder, baking soda, cinnamon, cloves, ginger, nutmeg, and salt together in a bowl. Stir pumpkin, canola oil, and vanilla extract into flour mixture until a thick batter forms. Pour batter into prepared baking pan. I usually use slightly less than 1/4 cup canola oil. Goes great with cream cheese frosting (or the vegan version)! Can be made into muffins with the addition of a 1/4 cup water, although cook time will change. I only use the cinnamon & ginger, then forgot to add the oil, but these still came out delicious! I was so happy I didn't need to frost them! I used gluten free flour and a 8x8 pan. I had to cook it about 10 minutes longer but it was like a moist, dense cake. I topped mine with cream cheese frosting and it was addictively delicious.